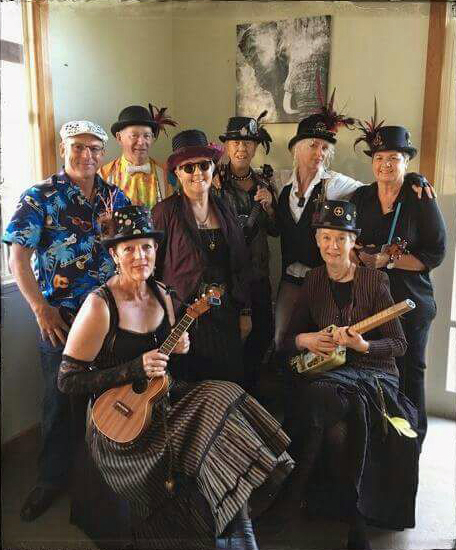 The Wanganui Ukulele Orchestra is set to present a fun-filled concert on Sunday 19 August 4.30pm to 6pm at the Sarjeant on the Quay. The nine member strong orchestra will play and sing a wonderfully varied repertoire, ranging from old favourites such as Choo Choo Ch’Boogie and Summertime through to music by George Harrison, Simon & Garfunkel and JJ Cale. The orchestra comprises electric bass, baritone, soprano and concert ukuleles, which are amplified, and modulated by a sound desk. A harmonica and recorder provide complementary effects. The concert promises to be quite a visual affair as the orchestra dresses up in steam punk outfits – their signature theme which involves lots of bold colour and quirky Victorian embellishments. Ukulele player, Dianne Blair, fresh from a steam punk festival in Oamaru sports a top hat and replica WW1 airman’s goggles. Jazz pianist, member of The Abacus Trio, and Patron of the Wanganui Jazz Club, Angela Crawford enjoys the opportunity to hear both local artists and those from out of town and encourages musicians to also consider offering their talent to the Musicians for the Sarjeant series which is specifically designed as a fundraising series for the Sarjeant Gallery’s redevelopment. Angela plays with the River City Big Band, which has given three Musicians for the Sarjeant concerts at the Sarjeant. She says the band treats the Sarjeant concerts as any other and puts in solid rehearsal time several weeks ahead.